John McAloon, from Stanley, New Brunswick, lettered in both hockey and football during his years at STU and was one of only a few athletes in STU’s history to play at the university level when still in high school. McAloon, who played a record six years for STU, was known as a “puck-chaser.” He played a fast-paced hockey game and regularly lead the team in scoring. 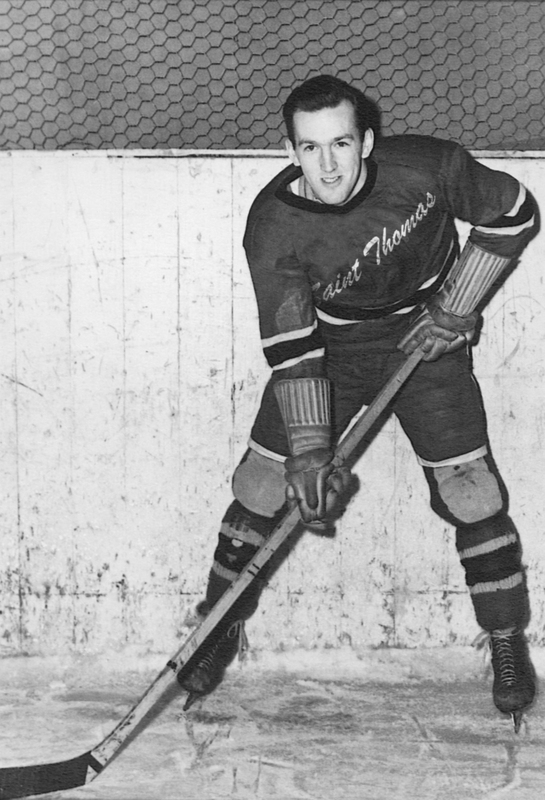 A star of both the Maritime Intercollegiate Athletic Association and the New Brunswick North Shore Hockey League, in which St. Thomas also played, McAloon was known by his classmates as “Mr. Hockey”. In 1949-1950, STU’s “Mr. Hockey” had 58 points in 18 games, leading the league in scoring and securing his place on the Wall of Fame.